Hair! One can't deny the fact that however you choose to style or wear your hair, it is a reflection of a part of you. Be it bald, natural, permed, weave, dreads, any form. Going natural Is sort of the it thing today in every good way. I won't say I haven't been asked the question or the thought hasn't crossed my mind a couple of times. If you'd asked me couple years ago, I would have said never, but after my big haircut, I've decided to never say never at least when it comes to my hair. Before my haircut in 2012, I had something against short hair, even a trim would put me on edge. Might have something to do with going to a school that mandated short hair cut for girls. As it turns out, I'm over that"fear" now. lol. I loved my short hair and I've been entertaining the thought of cutting it again, different style this time. Right now I have no interest in going natural but I can't say what the future holds with Eliana in the picture. Although, she barely has enough hair for anything, I'm beginning to take interest and learning how to care for natural hair. It doesn't hurt to start doing the proper things and taking care of her "half mohawk" hair at this stage. I know a couple of ladies who went natural for their daughter for all the right reasons. You know your daughter will eventually get to that age when she'll start asking a lot of questions; oh, that time will surely come. The question about hair as a Black/ African American family will most likely come up. As a mom, how do you explain the difference in your hair to your daughter and do you teach her to love her hair by leading by example? Knowing at that age, you as the parent are the most influential person in the child's life. Talking to these ladies, their daughters started making comments about how nice mommy's hair looks after a perm or good straightening. Asking questions about why her hair is so different from mommy's hair and such. You get the idea. In response to that, these moms went natural and it's truly a beautiful thing. For now, I can't say I know how I will handle these questions and situation if they do come up with Eliana. But, if it comes down to it, I'm not closed to the idea of going natural; If that will help her see how similar our hair is and help her love her mane. 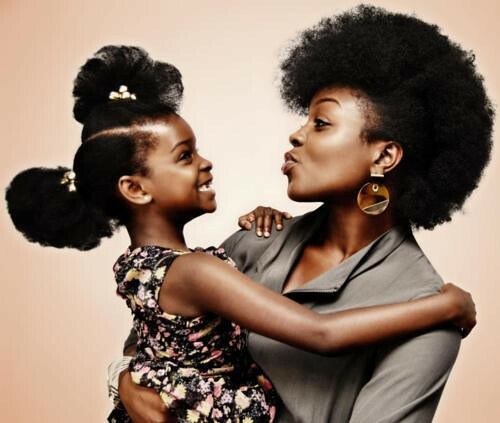 Would you go natural for your daughter?